Earlier this month, my grandma Britta passed away. 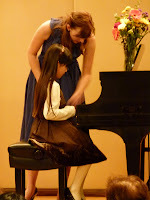 From her I get my stubborn Swedish streak, my love for the ocean and piano (and my piano itself!) along with boxes and boxes of sheet music. I am booked almost beyond capacity, and still receiving calls for more students on a weekly basis. Due to this high demand I have been receiving, I am looking to hire a second instructor to take on my waitlisted students. If you know anyone who would be qualified to do this, or if you are a potential instructor, please contact me!